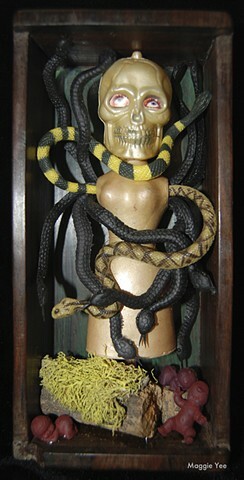 In Aztec mythology, Cihuacoatl, "snake woman" was one of a number of motherhood and fertility goddesses. Cihuacoatl was especially associated with midwives, and with the sweatbaths where midwives practiced. She is paired with Quilaztli and was considered a protectress of Chalmeca and patroness of Culhuacan. She helped Quetzalcoatl create the current race of humanity by grinding up bones from the previous ages, and mixing it with his blood. She is also the mother of Mixcoatl, whom she abandoned at a crossroads. Tradition says that she often returns there to weep for her lost son, only to find a sacrificial knife.